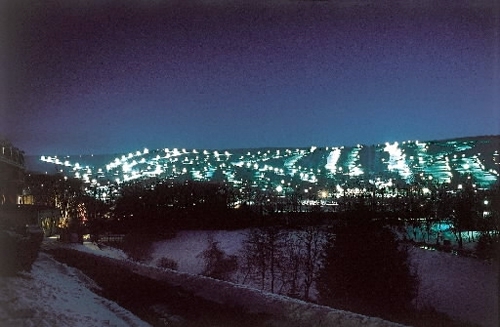 Rick's Pocono Blog: Ski With Santa At Camelback Mountain! Camelback Ski Mountain and Waterpark was Voted the Number 1 Resort in Pennsylvania for your Vacation and Resort Fun! Celebrating the Christmas and Holiday Season at Camelback will be a Blast. Camelback Slopes will be open and the Snow will be Falling! Snow Always Comes First in the Pocono Mountains and Camelback Mountain Resort is always coming at you with not only Skiing, but Holiday Fun as well! Guests Show up as Santa, Mrs. Clause, an Elf, or a Reindeer and Recieve a Complimentary Open to Close Lift Ticket! Head on over to Guest Services from 9 AM to 10 AM to collect your Ticket to a Wonderful Fun Filled day on one of the 34 Trails for your Skiing Experience at Camelback Mountain! There will also be a Group Photo of all the Santas and Winter Time Characters at 11 AM near the Base Area. Participants in this event must be dressed in Full Holiday Costume to Recieve the Lift Ticket. No Paper Costumes are allowed. Guest Services will make the Final Decision on Whether or not the Costume is Ticket Worthy or not. Bring your Holiday Cheer, Skiing Gear, and your Holiday Imagination to enjoy a Full on Winter Time Holiday Experience at the Best Resort in the Pocono Mountains, Camelback Mountain! Holiday Fun Storms through the Pocono Mountains Where Snow Comes First! Check out the many Ski Resort Homes! CLICK HERE for your Free MLS Search in the Pocono Mountains at my Website!